The Sabian B8 18" China Cymbal provides a good amount of aggressive attack, with a trashy sustain. Aggressive, Trashy Versatile China The 18.. The Sabian B8 18" China Cymbal provides a good amount of aggressive attack, with a trashy sustain. 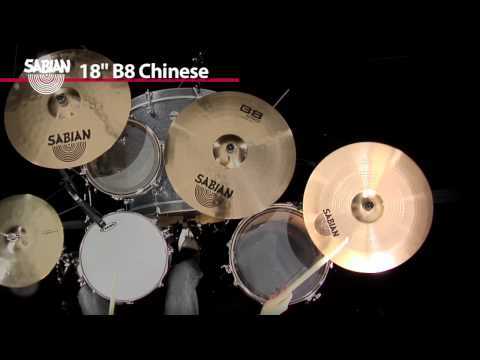 The 18" B8 China from Sabian has a great blend of aggressive, edgy attack and a raw, immediate, trashy tone. The thin weight of this China means it has a very quick response for a fast burst of focussed sound when you need it. It has a bright trashy sound but is controlled enough not to become overpowering. As a result, you can crash and ride this China in equal measure. Its versatile enough to be a main feature in your cymbal set up, rather than just an occasional accent sound. If you want a China to be an integral part of your cymbal line up, the B8 18" China is a superb choice. Its raw, trashy aggression is controlled enough to be used consistently without becoming unruly.